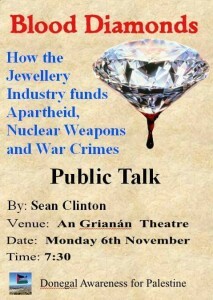 Donegal Awareness for Palestine is delighted and honoured to host Sean Clinton, the leading voice and coordinator of the campaign to expose the ongoing multi-billion dollar and fully legal trade in blood diamonds. PLEASE LIKE, SHARE AND INVITE YOUR FRIENDS ON FACEBOOK, THANKS! Over the past decade Sean has had over twenty article published by various publications including Electronic Intifada, Palestinian Chronicle, The Huffington Post, Rabble, Middle East Monitor, Mondoweiss, London Progressive Journal and others exposing the double standard in the jewellery industry which facilitates the trade in blood diamonds that fund rogue regimes guilty of grievous human rights violations. By far the biggest beneficiary of this double standard is Israel which is heavily reliant on diamond exports to fund its belligerent illegal occupations and brutal subjugation of the Palestinian people. His talk will be of particular interest to human rights activists, people involved in the jewellery industry and anyone thinking of buying a diamond in the near future. We hope you will join us for what promises to be a most interesting, revealing talk and discussion on Monday 6th November in An Grianán Theatre at 7:30 pm.